This stunning, premium flower arrangement is designed with maximum wow factor. Super romantic. Extremely feminine. Absolutely luxurious. 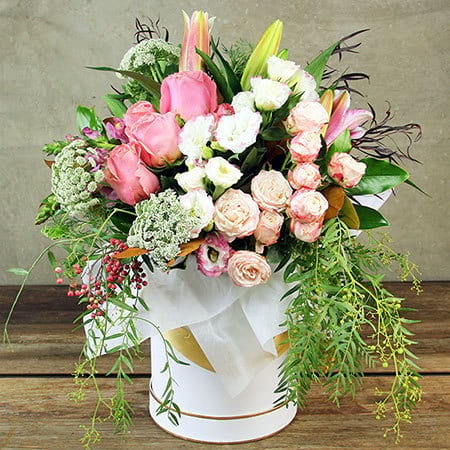 Our Rose Enchantment flowers, delivered Sydney wide, feature an abundance of pink and white blooms cascading from a `hat box`. A profusion of roses, delicate lisianthus and perfumed oriental lilies are the stars, with wisps of delicate seasonal foliages adding softness to the overall look. Choose a bottle of quality sparkling wine or divine chocolate from our range of gift additions, and you have a seriously amazing gift for a special occasion! 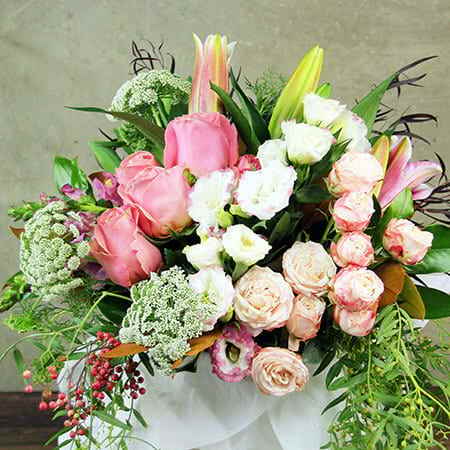 Order this premium flower delivery Sydney wide via our online store or give the team a call on 1800 66 66 46. Want to send a similar style arrangement outside Sydney? Give us a call directly or email sales@flowersforeveryone.com.au for a custom quote.